What's next in fighting? How about a game that takes 3D movement, polygonal characters, razor sharp graphics, awe-inspiring moves and a one-of-a-kind combat system? 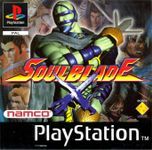 Or, in short, Soul Blade... arguably the most innovative fighting game on the planet. It's the 15h century and ten warriors from around the world, each wielding their weapon of choice, are in pursuit of Soul Egde - the ultimate weapon.